Basil, in a smoothie!? Yes. While this smoothie was originally concocted out of necessity since our basil plant has taken over the garden, it’s a welcome pairing with tart blueberries. I remember my first herb in a drink, and it definitely wasn’t a smoothie. One of my favorite happy hour places, MIX, serves a strawberry basil martini in the summer that will knock your socks off. If it can work for vodka, it can work for almond milk. 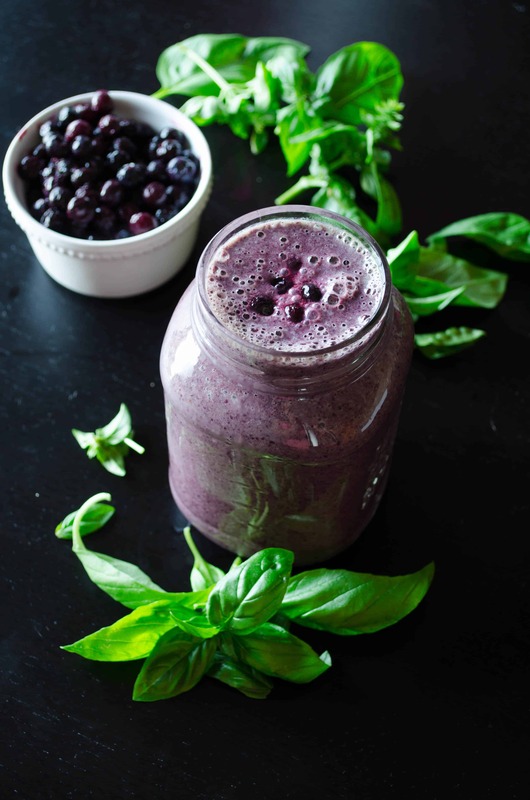 While you must like basil for this one (obviously) it doesn’t overpower the entire smoothie, just heightens the sweetness of the blueberries. I’m not serving you a pesto smoothie. 11 months of the year, I buy frozen blueberries. I can find delicious, organic berries for 1/2 the price of fresh, unless we are in late July. If you’re making a smoothie and crushing the berry anyways, I don’t think there is a difference in taste between fresh or frozen. Sometimes add protein powder to this, sometimes I don’t. 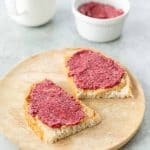 It really depends on what my needs are and whether I am enjoying a smoothie as a refreshing snack, breakfast, or post workout meal. I usually turn to my Vega container as I love the fortified powder and enjoy taste. 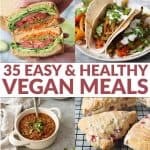 Other favorites include NOW Food’s pea protein, Trader Joe’s Hemp protein, or Arbonne protein powder. If you enjoy this green smoothie, be sure to download my Mix-and-Match Green Smoothie Visual Guide. 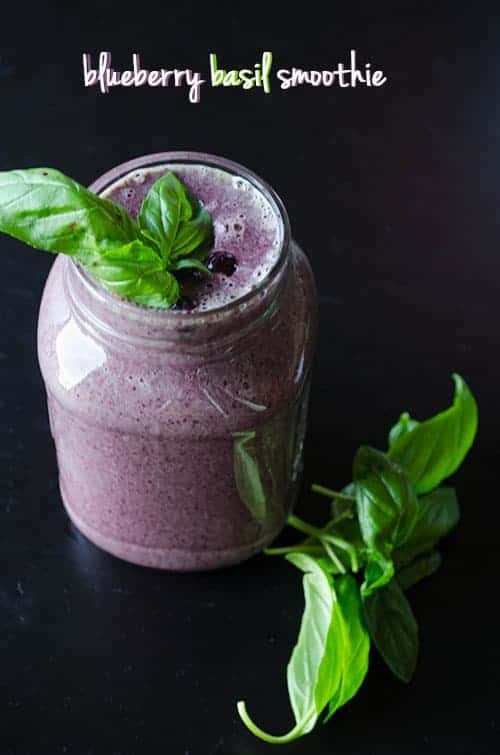 Blueberry Basil Smoothie! 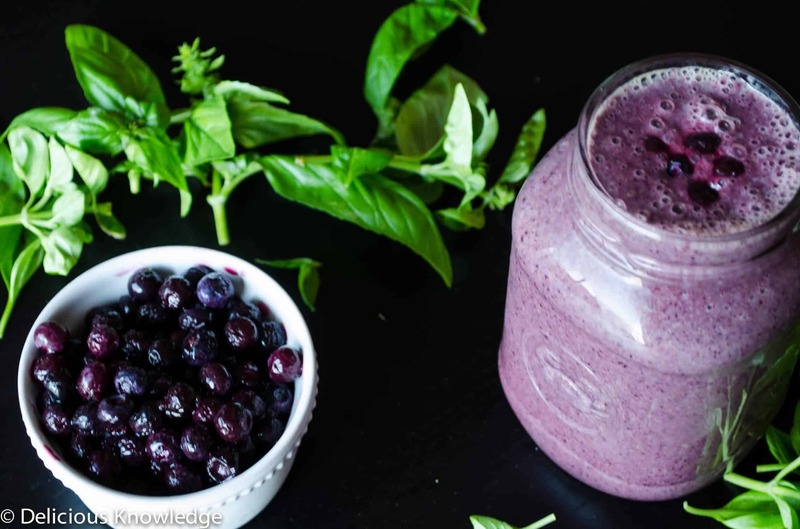 An incredibly refreshing smoothie made from blueberries and basil. Gluten-free and vegan. Place all ingredients in a high powered blender. Blend until creamy and smooth! Add more milk to desired thickness. If you used fresh berries, you might need to add an ice cube or two for a colder smoothie. I made this today! SO GOOD. I used kale instead of spinach and chia seeds instead of protein powder (they just happened to be what I have at the house). Thanks! Thanks Mary! Glad you liked it! I love basil and fruit together! It can really make it pop and way more interesting to eat/drink. This sounds so refreshing!